Bacon + Pepper Infused Vodka = MAGIC! 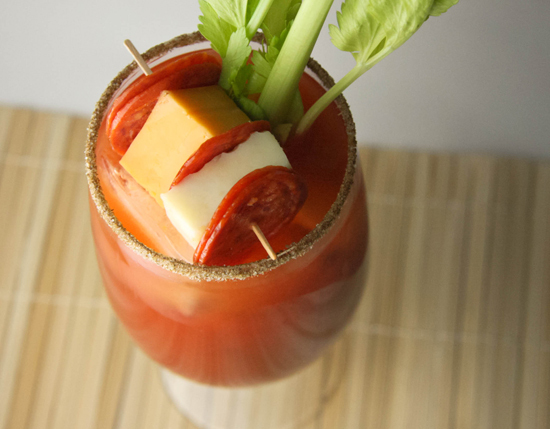 I think the thing I love most about the Bloody Mary is that it provides a good excuse to eat cheese and pickles and celery and olives and delicious chunks of meat. What other drink comes standard with snacks and beer? My husband and I, in our pre-child days, frequented Green Mill for the sole purpose of drinking their Bloody Marys. They are served with a ridiculous amount of snacks loaded into them. Plus, along with every BM purchase comes a tote filled with ingredients/condiments that can be added. We loved to load up our drinks with anything that contained spice and then we would feast and slurp away. Now that we have two little ones, we don't go to Green Mill to drink BMs anymore. In fact, we really don't drink BMs much at all. But since discovering the magic of bacon and pepper infused vodka, I could not pass up the opportunity to create the ultimate Spicy Bloody Mary! Now, there is one prerequisite for making this drink. You must have a love for peppery spiciness. 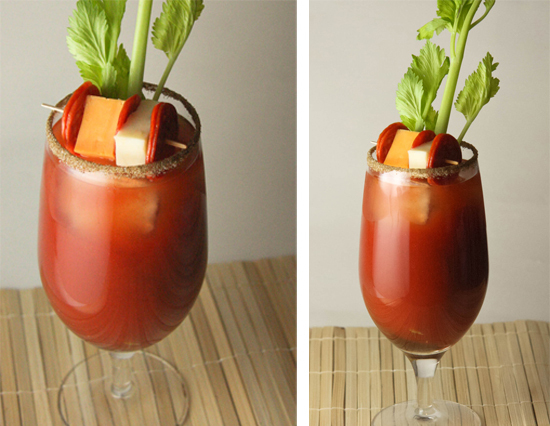 Oh, and you need to enjoy consuming Bloody Marys. If the above applies to you, then make this! It will not disappoint! Make a batch of bacon & pepper infused vodka (this process takes 1-2 days). Fill a celery-salt-rimmed glass with ice and add 1.5 shots of your infused vodka. Pour bloody mary mix over the top (use a mix that isn't heavily spiced or flavored..the flavors in the infused vodka take care of everything) and leave about 3/4 of an inch at the top of the glass. Add 2 tablepoons of pickle juice and about 6 or so dashes of Worcestershire sauce. Stir with a stir stick. Garnish to your desiring. Here are a few suggestions: celery, chunks of salami, olives of any variety, chunks of different types of cheese, celery, pickles, pepperoni, cherry tomatoes, cucumber slices, bacon, banana peppers. And last but not least, add a beer chaser, if that's your thing. Fill a glass with ice and add in this order: vodka, bloody mary mix, pickle juice and Worcestershire sauce. Stir. Add desired condiments.